A group of down-on-their-luck workers combine their abilities to make a Gallafentian-style commune... and bread! 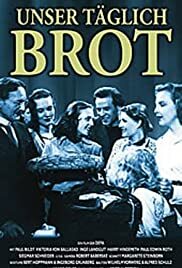 Unser taglich brot can be defined as the most meaningful DEFA production which successfully portrayed new socio-economic order and the ever changing Post war reality.It is set in post World War II Berlin in an era which heralded a time of hectic activity.Dudov analyses the questions and problems affecting the people at that time.He obviously wanted to familiarize members of the bourgeoisie with the concept of socialism.The Weber residence appeared more like a refugee camp as certain people didn't have a place to stay. Berlin was the hub of commotion as everybody had to work.This goal was all too evident in the schematic interpretation of the script.Unser taglich brot appears credible as it agreeably mirrored working class aspirations.It can be labelled as the first true socialist film made by DEFA studios.